Headed out towards St Leonards but was unable to launch due to the horrendous conditions and large waves at the boat ramp, so a change of plan including a small drive to Clifton Springs surprisingly brought along nice calm conditions. 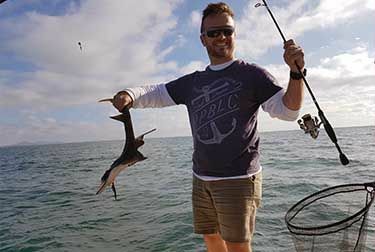 Tim Branagan, Paul Turner and Patrick Tyers set off fishing sunny conditions in the shallows, weed beds, mussel farms and shipping channels using Pilchard and Squid catching an avalanche of small Flathead, some whiting and even a few pesky Banjo sharks and Toad-fish. Was a very enjoyable fishing session enjoyed by all.